Join us for a brand new clinic, offered by the Foothills Branch, to make you comfortable in your winter navigation skills. The Foothills Navigation Committee is proud to offer a brand new clinic not offered by any other branch: Winter Navigation! This one night evening clinic is set for Thursday, Jan 25, 2018 at 6pm. Are you an experienced navigator looking to expand your skills for winter travel? Would you like to learn the difference between summer and winter navigation? The Foothills Winter Navigation course is aimed to teach key points of winter travel to experienced navigators. 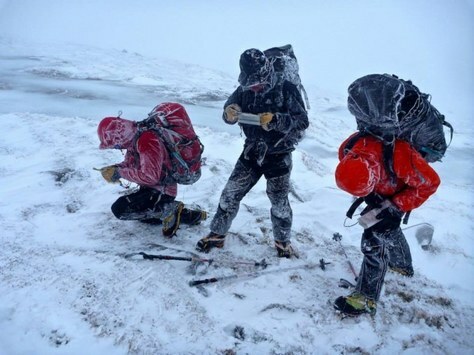 It is a one night evening class aimed to make you comfortable in your winter navigation skills. This is not a beginner class, and basic/wilderness navigation skills or equivalent are required to participate. Prior to the Winter Navigation course, we will offer a refresher class for those needing to brush up on navigation skills. If you do not have the "Basic Navigation" badge, but you have documented/equivalent experience please contact the leader at ryandubberly@gmail.com to be added to the course roster. Plan your trip based on terrain using physical and digital trip planning skills. Use both digital and analog tools in conjunction to navigate and minimize avalanches. Use snow wands, GPS tracks, and other techniques to navigate in the winter. Understand hazards and differences between summer and winter navigation. Understand and identify avalanche runout zones. Use digital and analog tools to determine slope angles, location, and paths. Please be sure to bring the required equipment to the lecture. Any questions, email the leader at ryandubberly@gmail.com.